When you hear that there’s rain in the forecast, do you excitedly anticipate a relaxing day indoors as a gentle shower traces a path down the outside of your windows? Or, do you start to round up the buckets and towels to mop up the water that will inevitably leak inside? No matter the season, leaking windows can pose major problems including structural and aesthetic damage as well as increased heating and cooling bills. It’s important to address water leaks when you first notice an issue. By taking the time to investigate the situation now, you’ll reduce the risk of costly repairs later. While older windows often experience water leaks, newer ones can also be at risk. Generally, there are three key areas that cause windows to leak: house design, installation and maintenance. Lack of overhangs to drain water off the roof and protect wind-driven rainwater from entering through the windows. Improperly angled fascia board above the window. It should be angled outward to direct water away from the unit. Poorly installed or breaks in the flashing will allow water infiltration. Using building paper or house wrap instead of specially designed window flashing will allow water to seep behind the paper and into the wall area around the windows. Broken or missing caulking at the window flange and at seams. Cracked glazing putty—the glass seal will be broken and allow for moisture and condensation to get between double-glazed windows. No paint seal—paint should slightly overlap from the window molding to the glass to create a tight seal. How can I determine where the leak is coming from? To identify why your windows are leaking, it is most important to figure out WHERE they are leaking from. In a previous post, we provided pictures of different leaks and what the cause may be. Leaks on the wall around, above or below the window, often mean that there is an opening somewhere in the wall that is allowing water in and causing it to run along the studs of the window, pooling either below or above. But this exposed opening may not be directly around the window. In older homes leaks are just as likely to occur around the roof or upper floors. Unfortunately, it isn’t always easy to recognize the source of these leaks without removing the entire window. While your walls may still look new and fresh on the room side, there may be an evident pattern of rot, or even mold reaching all the way up the wall. 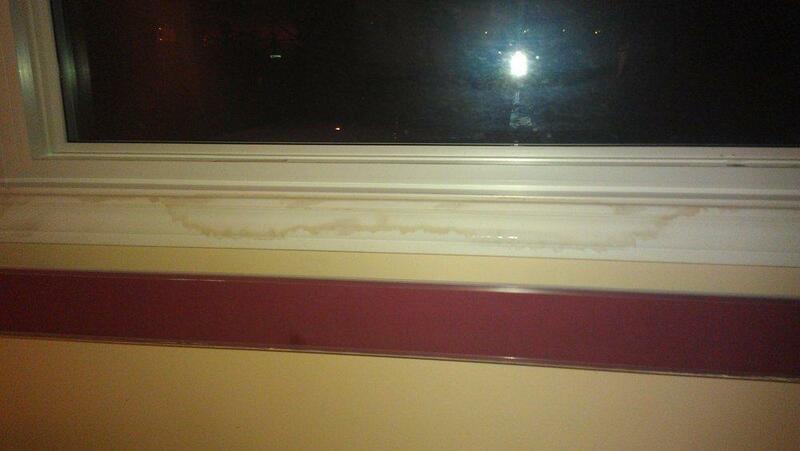 Leaks at the top or bottom of the window are often a result of leakage in the structure. If the window leak is visible in the area where the window sash meets the jamb, or on the window frame, chances are the problem is in the window itself. In older windows this may be a result of wear and tear from operating the window, sealed unit failure, or deterioration throughout time. It may also be something as small as worn weather-stripping, clogged drainage channels forcing water back into your home, or a misaligned sash. Leaks like this usually mean there is a problem with the sealed unit in the window. How can I fix window leaks? In reality there as many fixes as there are causes for leaks in windows. It could be something as simple as replacing weatherstripping on a slider window, or as complicated as having to rebuild half of your rotten wood wall before even commencing a window replacement. Remove damaged exterior caulking, clean the window frame and recaulk. Check the gasket between the window frame and the glass. Re-seal the glass to the gasket with clear silicone caulk. Make sure the sill at the bottom of the window frame is pitched downward to drain water toward the exterior. Clean dirt, debris and insects from weep holes in the frame bottom. Use a small wire to unplug these holes. This will allow any water that comes in through the screen to drain to the outside. If your window is leaking beyond the actual unit and is affecting or has affected the structure around the window, the only proper solution is to call in an experienced window replacement professional for an evaluation and possibly a full-frame window replacement. It is often difficult to tell if the there is moisture damage in the frame until the window is out. These walls look fine, but it’s a mess on the inside. While a full-frame replacement is a more expensive undertaking compared to other solutions, it is also the most thorough. Window professionals who reinstall the window will be able to remove any damaged or rotten wood from the frame and the wall structure surrounding it. But what is perhaps more important in the long run, is that they will identify where the leak is coming from, and be able to tell you whether it is directly related to the windows, or is coming from another part of the wall. How can I prevent future window leaks? Although most modern windows are hailed to be “maintenance free” there is still some maintenance that needs to be done to ensure the best performance from your windows. Make sure to check the caulking around the outside of your window for a continuous seal. Replacing the caulking can bring the condition of the seal back the original ensuring a continuous closure for the window. If you have operable slider or hung windows be sure to check the cleanliness of your drainage channels. As debris, leaves, and even dust falls into the channel it can often block the natural flow of water and cause pooling in the window. Leaks can also occur when rain water enters through the roof, chimney or loose-fitting siding. Often, the water will follow an unusual path along ceiling joists or wall studs until it reaches a window frame where it can then drip inside. Make sure to replace any damaged or missing roof shingles, caulk gaps around fireplace chimneys and exhaust pipes, and secure siding to stop water from seeping behind it. Even with proper maintenance, you may eventually experience water leaks. It’s important to seek some professional help to identify the source and extent of the problem. Whether you end up seeking a window repair or replacement company, who you decide to go with can have a direct impact on how well the problem gets resolved. Be sure to ask the project consultant, repairman, or installer why they think the window is leaking where it is, and their recommended solution. While you may not want to do a complete replacement, this may be the best solution to eliminate leaky windows.